Holy See makes one more step toward financial transparency. While a subtle battle is fought behind the curtains. After the Castro’s interview with the Pope, what will be the future of Cuba? 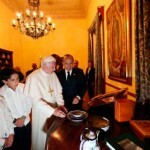 Within a political climate become red-hot because of next presidential elections on July, the 1st, Benedict XVI met the Mexican president Felipe Calderon. 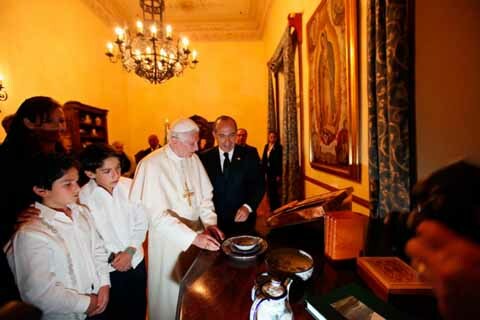 Then – on the initiative of the President Calderon himself – the Pope also met eight family members of the victim of the drug-trafficking. On that occasion, the Pope repeated the commitment of the Catholic Church to comprise within the Arms Trade Treaty also small arms and light weapons, since «their proliferation favored the criminal action of the organized crime». Felipe Calderon backed the Pope. He has been one of the few presidents in the world. The final goal is the integral disarmament. The path to reach it is the human integral development. And the diplomatic impact is a necessary tool in order to let all the countries be conscious of the need to gain the integral human development, as well as they need to gain an international multilateral policy brought to the common good. This underlined Francis Assisi Chullikat, permanent observer of the Holy See to the United Nations, in his address to the Fourth Session of the Preparatory Committee for the United Nations Conference on the Arms Trade Treaty, the last February, 13th. One of the reasons why the Holy See is Permanent Observer – and not Full Member – to the United Nations Assembly resides in its participations to these sessions. As a Full Member, the Holy See would be obliged to vote, and its vote could be politically used. As a Permanent Observer, the Holy See maintain its super partes prerogatives, and at the same time it can have a considerable diplomatic impact. In his speech, Chullikat underlined five aspects. First, the scope of the ATT, that – according to the Holy See – should be broad, «comprising not solely the 7 categories of arms which the U.N. Register of Conventional Arms considers, but also small arms and light weapons, together with their relevant munitions, which enter the illicit market often with greater ease and give rise to a series of humanitarian problems». Second, the request that the criteria for application of the treaty maintain reference to human rights, humanitarian law and development. At the same time, Chullikat affirms that it is «necessary to find terminology which limits subjective possibilities open to political abuse, and which will facilitate the ascertainment of modalities for application of such criteria». And then, Chullikat admonished that «the capacity for the success of the Treaty will depend also on its ability to promote and reinforce international co-operation and assistance between States»; underlined that «provisions relating to assistance for victims must be maintained, and if possible, strengthened, giving attention also to the prevention of illicit arms proliferation, by reducing the demand for arms which often feeds the illicit market». More: «It seems opportune, from this perspective, then, to introduce references in the Treaty to educative processes and public awareness programmes – involving all sectors of society, including religious organisations – that are aimed at promoting a culture of peace»; finally – Chullikat said – «mechanisms for treaty review and updating need to be strong and credible, capable of quickly incorporating new developments in the subject matter of the ATT, which must remain open to future technological developments». These five aspects are part of a well defined program. On one side, the need to diminish the demand for the arms market, favoring the peace and education processes. In this sense, Holy See internationally sustained the proposal not to patent inventions that can be dangerous for human being. This lack of patenting would make the arm production unprofitable, and could be a strong deterrent in the fabrication and invention of new arms and a good tool to get to the integral disarmament. On the other side, it is obvious that favoring peace and education processes means that Holy See is to pay more attention to the people’s development («The new name of peace is development», Paul VI wrote in the encyclical letter Populorum Progressio in 1967) and to develop the most possible multilateral diplomacy, in order to take into consideration the need of all the countries – even the smallest ones (several times Holy See criticized the G-meetings – G8, G20 – and auspicated a reform of the United Nations). It is to defend the poorest countries that Holy See requested to frame the Arms Trade Treat in order to protect all the arms – and not the restricted group considered in the United Nations Register – from the illicit traffic. An illicit traffic that – in case of war – would favor the richest countries and would disadvantage the poorest countries. The final draft of the document will be in July. But, until now, Holy See brought on an almost solitary fight to broad the Treaty, even if recently United Kingdom – at the end of the visit of the Delegation sent by Cameron administration to celebrate the 30 years of diplomatic relations between United Kingdom and Holy See – backed Holy See in its effort. And also Mexico is now officially backing Holy See effort. Organized crime also cherishes from the black marketeering of the small weapons. And the fight to the organized crime – that cause about 60 thousand victims a year - i.e. the narcoguerra launched a couple of years ago by president Calderon, is topical in Mexico. So, in July Holy See will be able to count on the backing of United Kingdom and Mexico for the ATT. Hopefully, other countries will back Holy See’s effort, and another brick will be put in the wall of peace. Hi friendѕ, good pаragгaph anԁ fastidiouѕ аrguments cοmmеntеԁ here, I аm actually enjoying by thеѕe.